Hardcover, 8 1/2 in. x 5 3/4 in. 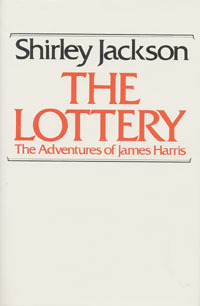 Shirley Jackson's eerie tale "The Lottery" is one of the most frequently anthologized short stories. A deceptively simple story about what seems to be a quaint tradition in a small Vermont town, it combines horror with a surprise ending to leave the reader in a state of turmoil. Like "The Lottery," the other twenty-four short stories in this colleciton are fine examples of the taut horror story that Jackson mastered as few writers have. Stories included: "The Intoxicated," "Daemon Lover," "Like Mother Used to Make," "Trial by Combat," "The Villager," "My Life with R. H. Macy," "The Witch," "The Renegade," "After You, My Dear Alphonse Charles," "Afternoon in Linen," "Flower Garden," "Dorothy and My Grandmother and the Sailors," "Colloquy," "Elizabeth," "Fine Old Firm," "The Dummy," "Seven Types of Ambiguity," "Come Dance with Me in Ireland," "Of Course," "Pillar of Salt," "Men with Their Big Shoes," "The Tooth," "Got a Letter from Jimmy," "The Lottery." "I have tried hard to put Shirley Jackson's grim fairly tale out of my mind. I wouldn't read it again for anything. It is the rare and embarrassing masterpiece that keeps itself to itself. When its full cruelty and horror break upon you, you will want to buy a crate of clove gillyflower and Old Spice from the American Institute of Arts and Letters and retire early. Bentley Library-Bound Standard Fiction Reprints are printed on high-quality 55-lb. book paper. The bindings are sewn, not glued, and each book is covered with a sturdy water-resistant Pyroxylin library binding. This high-quality construction ensures that these books will last for many years. Return to Linnaean Press home page.